British Columbia’s economy leads Canada. In 2015, we led Canada by creating more than 50,000 new jobs. This rosy picture doesn’t square with recent polling which found that nearly half of British Columbians see the economic conditions in BC as “poor” or “very poor”. Two in five said they were planning to reduce the family spending on entertainment and meals in 2016. 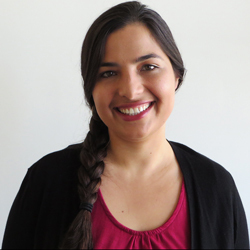 Why such a big difference between government claims and the experience of households? Because the BC economy is not creating nearly as many jobs as the government would like you to believe and many of the jobs created are not good jobs. The standard way to find out how many net new jobs were created in 2015 is to compare employment figures for 2015 with those from 2014. According to the latest data from Statistics Canada, this shows that the BC economy created 27,800 new jobs in 2015 (2,306,200 jobs in 2015 minus 2,278,400 jobs 2014). The throne speech claim of “more than 50,000 new jobs”, appears to be based on a comparison of employment in December 2015 to employment in December 2014, drawing on this Statistics Canada release. The December to December comparison looks so much better because job creation picked up in the second half of the year after a lacklustre performance over the first 6 months of 2015. This pick up is a good sign but it doesn’t erase slow jobs growth in early 2015. All in, BC’s employment growth in 2015 wasn’t particularly strong – 27,800 new jobs represent only a 1.2% increase in employment. That’s enough to keep up with population growth, but it’s hardly something to brag about. In 2015, BC saw the second-lowest increase in private sector paid positions since the end of the 2008/09 recession. BC’s private sector created only 5,600 paid positions in 2015, compared to 4,700 new paid positions in the public sector and 17,600 self-employment “jobs”. Since the recession, self-employment has tended to fall in years of solid growth of paid employment and rise in years of weak growth. In other words, the growth in self-employment in 2015 should be interpreted as a sign of job market weakness, not strength. Statistics Canada’s new Job Vacancy and Wage Survey helps explain why so many British Columbians are feeling pessimistic about the economy. While BC had the highest vacancy rate of all provinces in the third quarter of 2015, BC’s job vacancies offered one of the lowest average wages in the country, $17.65/hour. Only job postings in PEI, NB and NS offered lower wages. Among the ten occupations with the most job vacancies in BC, five paid less than $12/hour and only two paid more than $15/hour. 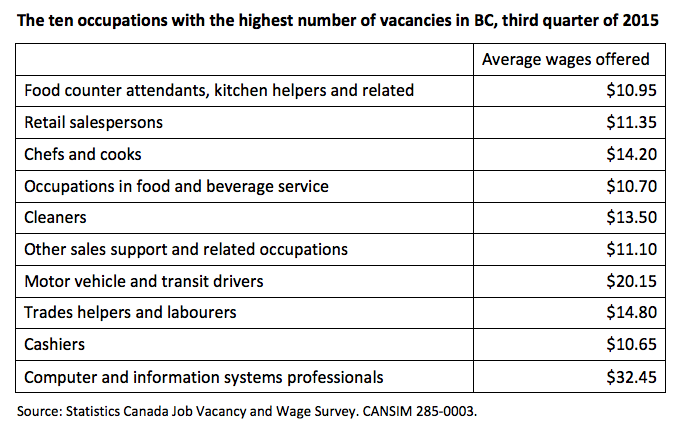 These ten occupations accounted for 43% of BC job vacancies in the third quarter of 2015. All new paid positions created in BC in 2015 were temporary. 53% of them were seasonal and another 41% were term or contract jobs (data here). Temporary jobs provide less job security and often come with few, if any benefits. The pick up in job creation in the second half of 2015 is good news. But we can’t forget this employment growth comes on the heels of two years of particularly weak job creation, when the BC economy only added a total of 16,000 jobs. Only 71.3% of working age British Columbians had a job in 2015. 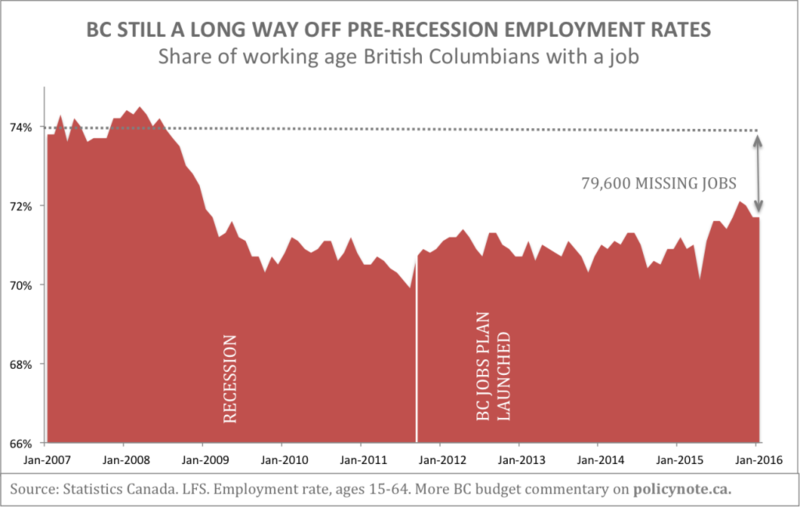 Despite the recent pick-up, BC needs more than 79,000 new jobs to return to the pre-recession employment rate for working age British Columbians. That’s more jobs that have been created in the last four years. combined. Looking at it this way, the BC Jobs Plan seems a lot less successful than the Premier claims it has been.